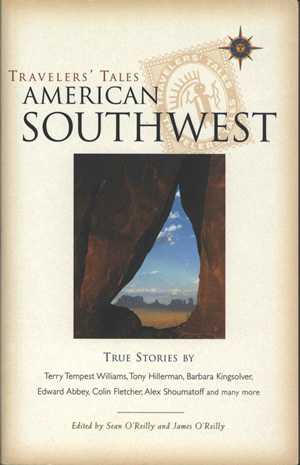 This is the Traveler's Tales American Southwest edition, containing the essay "A Museum Etched in Stone" by Tony Hillerman, about the geology, history, and culture of Canyon de Chelly. The volume also contains "True Stories" by Terry Tempest Williams, Barbara Kingsolver, Edward Abbey, Colin Fletcher, Alex Shoumatoff and "many more." It is edited by Sean and James O'Reilly. The cover design and art direction are by Michele Wetherbee. The front cover has a faintly speckled tan background, shading darker toward the edges. At the top left, the book title is printed, overlaid on an opacified tan graphic resembling a postage stamp with a Yei figure at the center. In the top right corner of the cover is a compass rose with a yellow "sun in splendor" face on a blue background in the center. The center of the front cover is a photograph by David Muench of a southwestern landscape (a skyline of mesas beneath a blue sky with puffy white clouds) seen through an opening in a red rock canyon wall. Below the photograph is a partial list of authors, and the names of the editors. The top third of the back cover has an orange-red background within which is printed "Discover the American Southwest" along with a brief description of the book. Below, on a speckled tan background similar to the front cover, are teasers inviting the reader to share an experience with an author through the included stories. The bar code and book price are at the bottom of the back cover. Binding: Full-color paper covers. "TRAVELERS' TALES GUIDES," "TRAVELERS' TALES SOUTHWEST," the sun in splendor compass rose graphic, and the editors' names are printed along the spine.